Achdus and Achiezer. The two words are frequently mentioned together in the same sentence, because somehow, they just seem to fit together. Last Sunday evening, the juxtaposition could not have been more apparent. Achiezer's second annual Tribute Dinner once again gave over 1,000 people from all neighborhoods of the Far Rockaway/Bayswater and Five Towns community a chance to set aside Shul affiliation, yarmulka type and personal interests, to join together in support of one undisputed cohesive agent: Chesed. Achiezer's work is well known throughout our community and beyond, but this dinner gave attendees a unique chance to get an in-depth, hands-on view of Achiezer's inner workings. The upper level of The Sands featured "The Foundry", a fiery display and spectacular walk-through of Achiezer solutions, as they're forged. Utilizing The Foundry's interactive iPod stations, the guests persused Achiezer's programs and services (including crisis intervention, medical recommendations, behavioral health, health insurance, and more), gaining a real understanding of the process through which the community's problems are solved at Achiezer. To quote one guest: "I always knew that Achiezer had an organized and detailed infrastructure; but getting to see it close up was just eye opening." Indeed, all of the guests -- those already familiar with Achiezer, and those less so -- entered the main ballroom accompanied by the comforting knowledge that virtually every problem in our community has a solution. Following a sumptuous buffet dinner catered by Sharmel Caterers as well as a delectable sushi bar by The Sushi Spot, the program commenced promptly in the Chuppa room. Master of Ceremonies Dr. Moshe Schlusselberg, a resident of Woodmere, opened the program with some personal reflections of Achiezer's modest beginnings, followed by a brief synopsis of Achiezer's mission and accomplishments. Mr. Shulie Wollman, Achiezer's Chairman of the Board, discussed Achiezer's availability -- literally 24/7/365 -- and incredible determination to assist our community, despite all the odds. Achiezer senior Board Members Mr. Ronald Lowinger and Mr. Michael Krengel led the assemblage in Tehillim, after which Rabbi Boruch Ber Bender rose for the keynote address. In a passionate account, Rabbi Bender shared the story of Ruth, an Achiezer volunteer whose regular visits to the nursing home were singularly responsible for bringing a woman back from the brink of depression, to the doctors' amazement. The story was a clear demonstration of what was to become the theme of the evening: the concept that no act of Chesed can be considered small; and that even a small kindness can save a life and recreate a soul. Describing Achiezer's 24-hour emergency hotline, Rabbi Bender provided a true-to-life, behind-the-scenes view of the lifesaving work that Achiezer does on a regular basis -- in myriads of ways, both large and small. Awards were presented to the evenings honorees: Dr. Marcel Scheinman (Physician Appreciation Award); Yoni and Esther Novak (Hakoras Hatov Award); the Community Assistance Fund (Community Appreciation Award); and Rabbi Zev and Leah Bald (Kesser Shem Tov Award). The feature video, fittingly entitled "Our Community's One Call For Help," included personal and emotional anecdotes shared by community members, as well as messages of support from a variety of local Rabbonim and community leaders. Despite the relatively late hour on the Sunday evening just before Shavuos, the crowd stuck around to enjoy the lavish dessert spread and bask in the sheer enjoyment of the evening for just a while longer. 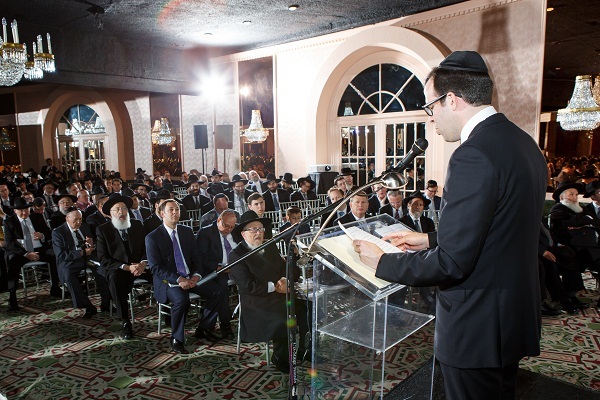 The evening was a celebration of the past and a commitment to the future, which left guests from across the spectrum inspired and committed to joining this bastion of Chesed. Achdus and Achiezer. The two words go together...not just for one magical evening, but for every single day, of each and every year.